The phrase “breeding like rabbits” isn’t just an empty statement. Rabbits are nearly always fertile, coming into their first breeding cycle as early as three months of age and giving birth only 30 days after breeding. Baby bunnies are born blind and without fur, growing soft fuzz over their entire body by the time they’re one week old. Telling the color of baby rabbits is one of the more challenging aspects of raising rabbits. Wash your hands thoroughly and gently pick up the bunny, resting it on a soft towel. Hypothermia is one of the leading causes of death in newborn bunnies, so keep the bunny covered while out of the nest. Examine the baby rabbit’s skin color as soon after birth as possible. Bunnies are born nearly hairless but their skin reflects the shade of their adult coats. Bunnies with light coats such as white or cream will have pink skin, while black and blue-based bunnies will have black skin. Look for blotches in the skin indicative of broken-coated bunnies. A broken coat is defined as a solid base coat mottled with contrasting highlights. 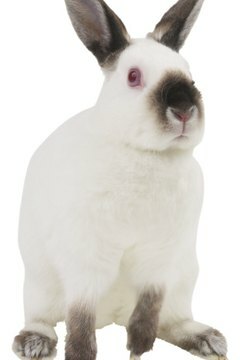 Dutch rabbits, for example, have a black base coat with strip down their noses and a white band around their shoulders. Baby Dutch bunnies will have black skin except for their shoulders and forelegs. Check the bunnies again once they are one week old. By this time, the nearly colorless baby fuzz has been replaced by downy fur that clearly displays adult coat colors. You may be able to predict the color of some of the bunnies if you know the color of both the buck and doe. Use a rabbit genotype calculator to help you determine possible outcomes. Never keep bunnies out of the nest too long. Even wrapped in a towel, young bunnies may get too cold. Welsh's Honeybuns Rabbitry: What Colors Will I Get?